Ignite explosive muscle gains with these 3 powerful ways to finish your workout. You'll get a monster pump and spur some booming growth! There's nothing like spending the Fourth of July watching a spectacular fireworks show. At first, a few intense pops of colorful pyrotechnics get your blood flowing, but the bursts and blasts grow as the display progresses. By the end, the grand finale usually includes an epic boom and monstrous ribbons of fire. Wouldn't it be great if your workout ended the same way? I'm talking about finishing your workout with a pump so intense it feels like your skin is about to explode. Like the blood in your veins is about to undergo spontaneous combustion. Like you threw everything you could muster into your workout and ended it with a mighty bang. Like you're about to become a monster! Guess what? I may have an ignition switch for you. 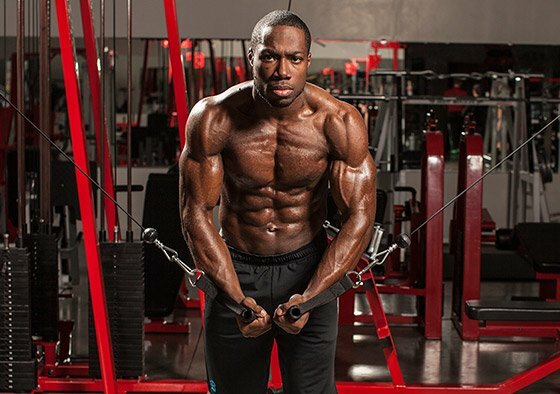 In fact, I'm going to show you how to apply three very distinct finishing-move techniques to the end of your workouts so you can achieve the pump I'm talking about and instigate explosive growth. What you do early in your workouts when your strength is high arguably has the most impact on your efforts to build size and strength, but your last movement—the finishing move—is your chance to finish the day off with a bang. Bodybuilders often go to great lengths to inflict maximal muscle damage to a body part at the end of a workout, and for good reason. To help you finish off your workout with the perfect pump, I've got three techniques for you to try—though not on the same day! While Tabata was created as a cardio activity, it has also been adapted for use with weights as a finishing move. Essentially, you train all-out for 20 seconds, follow that with 10 seconds of rest, and repeat for a total of four minutes. That equates to eight 20-second segments of work divided by very short 10-second breaks. The style of training may sound a lot like high-intensity interval training (HIIT), which also relies on alternating high- and low-intensity bouts of training, but HIIT isn't defined by a four-minute limit, nor does it constrain the length of the work or rest segments. While both of these have routinely been applied to cardio training, they can be adopted to the weight room as a finishing move. A Tabata-inspired finishing move should be done with a multijoint (compound) exercise to ensure the greatest amount of muscle mass is engaged. Choose an exercise in which it's super easy to get in and out of the starting position quickly; to that end, a 10-second break just isn't enough time to get ready for a set of seated overhead dumbbell presses, but doing that same movement on a machine would be far easier and faster. Because keeping reps clean becomes more challenging as you become fatigued, opting for machine movements might be safer than using a free-weight movement. You're counting time—not reps—so use a powerful motion, pushing yourself as hard as possible. Using a 12-15RM (a weight you can lift for 12-15 reps and no more) is best because you don't want to be struggling to complete a rep when you still have time on the clock. Go a full four minutes and call it a day! This one was created by Hany Rambod, a contest-prep coach who has mentored many Olympia winners and has earned the title "The Pro Creator." Rambod has written about FST-7 on Bodybuilding.com before, but never quite like this. FST-7 is a bit similar to the Tabata-style adaptation, but here you do just 7 sets of your finishing move (not 8), and rest periods range from 30-45 seconds. Still, 7 sets is almost double what most trainers do on a last exercise for a target body part, so it's plenty of volume to give you that monster pump. Since there's no time constraint, each set is done to failure with a weight you can do for 10-12 reps. Because the technique allows for a longer recovery period, there are fewer limitations on what exercises you can use it with. And it can be done with either single-joint or multijoint movements, so cable crossovers and bench presses both work. Rambod suggests the technique is effective on any piece of equipment, but he recommends that beginners stick to machines. The technique that no one seems to want to take credit for is also one of the most punishing, and It's called the 10-Minute Pump, and I've been a big fan of it for years. 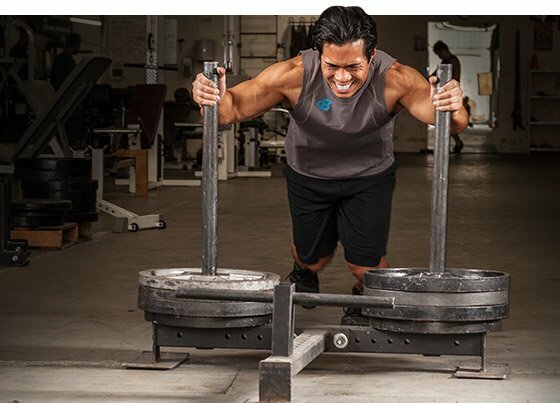 Rather than limiting the length of time of each set or the number of sets like the previous techniques, this method sets a time limit of 10 minutes for the entire exercise you choose. In other words, you do as many sets as you can in 10 minutes. Originally prescribed to hit a smaller muscle group like triceps after a larger one such as the chest, the technique can also be done as a finishing move. Because of the short rest periods and the need to change weight quickly and in small increments, it's best done with cables on bilateral movements (using two arms at the same time). Choose an exercise that allows you to quickly get into and out of the start position, like rope press-downs. Choose a weight you can do for about 10-12 reps.
Do the movement for as many reps as you can. When you finish, take a 20-second break, and no more. Do another set to failure, and repeat this work/rest pattern for the full 10 minutes. Because the rest periods are so short, you won't be fully fatigued when you start the next set, but do as many reps as you can. Once you can no longer complete 8 reps, reduce the poundage by a single plate. That should push your rep count up again, but as fatigue once again makes it harder, you'll have to take off another plate. Keep taking off one plate at a time when you can't complete 8 reps.
Continue with short, 20-second rest intervals, dropping the poundage only when you have to. You should feel an incredible pump halfway through, but keep going the full 10 minutes. At the end of the day, you don't have to wait for a team of pyrotechnic experts to put on a fireworks show. You can host your own show in the gym with these advanced techniques! Kraemer, W. J., Marchitelli, L., Gordon, S. E., Harman, E., Dziados, J. E., Mello, R., ... & Fleck, S. J. (1990). Hormonal and growth factor responses to heavy resistance exercise protocols. Journal of Applied Physiology, 69(4), 1442-1450. Gotshalk, L. A., Loebel, C. C., Nindl, B. C., Putukian, M., Sebastianelli, W. J., Newton, R. U., ... & Kraemer, W. J. (1997). Hormonal responses of multiset versus single-set heavy-resistance exercise protocols. Canadian Journal of Applied Physiology, 22(3), 244-255.